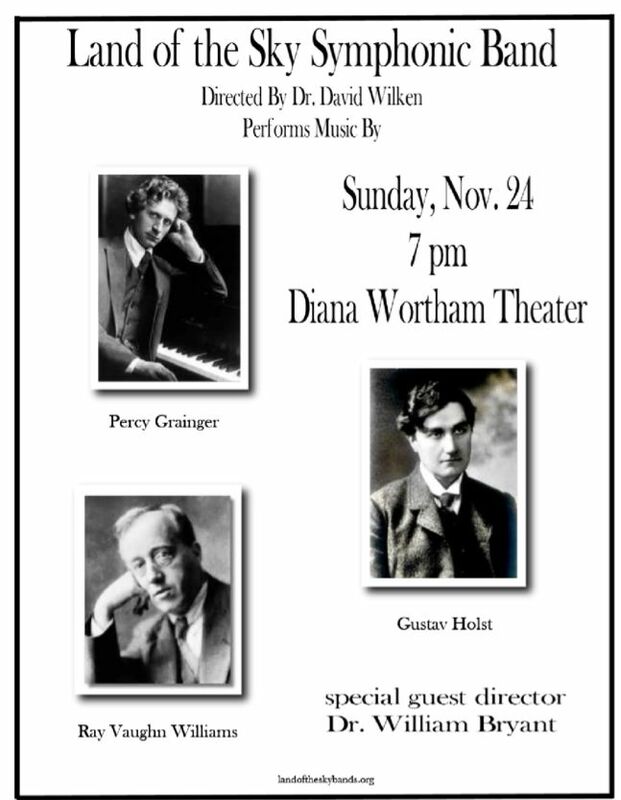 This Sunday, November 24, 2013, I’ll be conducting the Land of the Sky Symphonic Band in performance at the Diana Wortham Theater in Asheville, NC. This concert has a theme featuring composers who used or were strongly influenced by British folk music in their work, Gustav Holst, Percy Grainger, and Ralph Vaughn Williams. Guest conducting on this concert will be Dr. William Bryant, who is a noted authority on Grainger and his music. If you’re in western North Carolina this weekend please come out to hear us perform. Today is Veterans Day in the U.S. (November 11, 2013). Here is my arrangement of the fight songs of the U.S. Navy, Army, Air Force, Marines, and Coast Guard, performed by the Trinity Jazz Orchestra. In many band programs, however, this can be a real challenge for directors to implement, particularly if he or she has had little to no experience playing jazz. If you don’t happen to play one of the typical jazz instruments the chances that you feel uncomfortable are high. This essay is designed for band directors who want to introduce improvisation with their students in the concert band specifically, although music teachers should be able to find ways to adapt these ideas for almost any situation with a little thought and creativity. The first thing to understand is that everyone improvises all the time, but we often don’t think about it when it happens because we’re so used to it. When rehearsing our concert band we improvise a great deal by responding to what we’re hearing and addressing them in patterns that we know (or hope) will be successful. As we get more experience teachings we pick up on new ideas and try them out, eventually coming up with our own teaching style that fits our own personality and style. This process isn’t really all that different from how we can develop an improvisational style, it’s just a different context. Improvising for the first time can be a daunting task. There are lots of different things to keep track of all at once and the amount of multitasking is intimidating for many students. That said, when you consider improvisation at its basic level there are really three main areas of concern – when to play, what to play, and how to play it. When to play is usually the first thing I address with teaching improvisation to a new group of students in a longer-term improvisation class. Subtopics in this area of concern include using silence, playing with good phrasing, rhythmic density, etc. The main point I want to get across at first is that you don’t have to play all the time and, in fact, it’s often more interesting to leave room in your improvisations for your audience to guess what’s coming next. I like to demonstrate to new students what this can be like by improvising a solo by using much more silence than I normally would. When a soloist doesn’t play for a long time the tension can really build up and no matter what you play next the release can be quite surprising and enjoyable. Get your students to duplicate this in their own solos as much as possible. Leaving silence in improvisations has additional benefits beyond simply making your solos more interesting. It allows the accompanists to interact more conversationally. It also gives the student a chance to evaluate what he or she just played and how effective it was and then think about what’s coming up next. This is also another one of NAfME’s standards. Items that address what to play are actually pretty easy to find. This includes things like chord/scale relationships, playing chord tones and non-chord tones, playing outside the changes, etc. There are lots of great resources all over on this aspect of improvisation, so rather than duplicate a lot of it here I’ll instead focus on what I think the best way to teach this element of improvisation is. Music is an aural art form. It exists in sound, not on the paper. With improvisation it is even more important to learn to listen and imitate the sounds you hear. When introducing note choices to students new to improvisation I always teach them by playing a pitch and having them find it on their instrument by ear. A simple ear training exercise you can do with your concert band is to play random notes and have your students try to match pitch. Some students will be better than others and it’s helpful for struggling students to have a strategy to help them out. I usually advice my students to simply play a chromatic scale until they hear themselves match the pitch. Over time they will find it easier to hear when they’ve found the right pitch and may even begin finding it faster by learning how far away they are and leaping closer to the correct pitch. Once students get used to matching pitch with you playing the lead have a student volunteer play the random pitches instead. As an aside, I find many students will use their eyes, rather than their ears, to figure out the pitch. As a trombonist I get in the habit of playing lots of pitches with alternate positions to see if the trombone section is just watching my slide rather than finding pitches by ear. Students will often look over to their section peers to look at fingerings rather than risk guessing the wrong pitch. It’s up to you to encourage them to avoid this and instead really try to find pitches by ear. The payoff will be much better in the long run if they can learn to find pitches aurally, rather than visually. Once most of the class has found the pitch I will tell the band what the pitch is to help provide feedback, but I always make them give me an honest effort first. Once I have a band able to match pitches fairly well I will teach them by ear basic scales (pentatonic, blues scale, or scale fragments) that can be used to improvise over a simple vamp. If they want or need to write down pitch names I will usually allow it, but they again have to give me an honest effort to learn these scales by ear before I’ll help them with the pitch names. Next I’ll teach the band some simple riffs that set up a vamp (again by ear) that fits those pitches. As a composer I try to limit the number of independent lines I’m writing to no more than three or four (with some exceptions according to the effect I’m after). For the purposes of setting up a vamp for improvisation with a concert band I feel two or three riffs works best. Again, I teach my students the riffs by ear and have the whole band learn some basic riffs. After the band has got the gist of each riff I assign parts to them and get them to set up the vamp. Once the groove is happening, I’ll demonstrate by improvising a simple solo (using only the notes I taught them just before) over their accompaniment. Since I’m a composer and experienced improviser, coming up with chord vamps and riffs isn’t really a big deal for me, but for many band directors this is a brick wall. In order to help those folks out, I’ve put together some riffs that you can use in PDF form here. Three of the examples are simple two-chord vamps with three simple riffs notated in all standard transpositions. One example is a blues progression in Eb with parts for each standard concert band instrument. 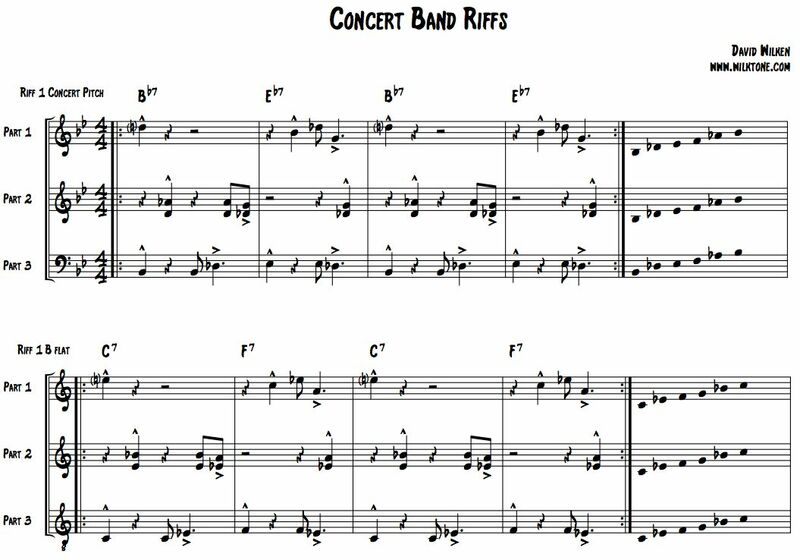 Again, I usually teach students these riffs by ear and then later hand out parts if needed (or, better still, have the students learn to notate these riffs themselves). Once you’re able to get your band riffing on this simple chord progressions you’re ready to get them to play solos. If you want to ease them into solo improvisation one way I like to get them started is to play a very simple (one or two note) idea with a metronome click and have them play the lick back at me. Use the a scale that will work over the vamp you want them to improvise over, but don’t use more than three notes (see the handouts from above for some scale choices over the vamps I wrote out). The point here is to teach them that they don’t need to play a very complex lick to sound tasteful. I emphasize that all they can play very interesting ideas by rhythmically improvising on even just one or two notes. Then go around your ensemble and have everyone play 2, 4, or 8 measures of improvisation. Some students will jump right in and go wild while others will freeze up. With the eager students it can be helpful to get them to scale back their improvisation and not try to squeeze in every idea they have into just 4 measures. With timid students my goal is to get them to play just one note (then just one note more, now two notes, etc.). You can also have some students practice playing longer solos. Another exercise I like to use is to have students come up with their own background riffs using only notes in the scale I’ve given them to improvise with. Each of the PDF examples I posted has three riffs, one that functions as a bass line, one chord support, and one melodic riff. Simply remove the melodic riff from the vamp and have a student play his or her own riff in place of it, then have the other students pick up that riff by ear. You’ll notice that in almost every step of my process I emphasize teaching students ideas by ear. Having good aural skills is a critical ability for improvisation. While it’s certainly possible to create interesting improvisations from selecting note choices by reading notation this approach is limiting. Teaching your students to match pitches by ear will train them to “hear” the ideas they have in their head and play them more spontaneously. Conversely, only teaching improvisation through playing by ear will also hinder development. I always like to point out that music theory IS ear training and vice versa. After you teach improvisational techniques by ear go back later and teach your students the theory behind it. More advanced concepts can be first learned via a theoretical approach (e.g., read this scale and then apply those notes over this chord vamp), but emphasize while practicing this way that your students should be listening closely to the sounds and making the connection between what they are seeing with what they are hearing. When using this approach reiterate to your students that they should intentionally leave a lot of silence in their improvisations to give them a chance to evaluate what they just played and then think a bit about what they are going to do next. I recommend that you make improvisation a regular warmup with your group. You don’t have to improvise with them every day or even every week, but go back to improvisation every so often with them to reinforce what they’ve learned and get them to practice it more. Like most musical skills, improvisation abilities are developed over the long term and we can’t simply teach it in one class and expect that our students will become successful at it. In fact, you can break down all of the above steps and exercises into their own warmup and spread them out over the course of a week or so. Easing your students into improvisation this way will help some of your students who are more nervous about improvisation get used to the idea of playing a solo over time. All your students will benefit from the repetition of ear training and music theory over time, helping them retain these skills. And of course, have fun with it. The more you project that you’re enjoying the music the more it will “jazz up” your concert band for learning to improvise. Even if many of these students will never join a jazz band you’ll find that the ear training and music theory practice they get will help them become better musicians and benefit your concert band in ways you didn’t expect.